The Cradle of Cricket and the rebirth place of English commercial wine production. 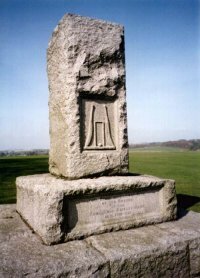 The Memorial shown on the right is on Broadhalfpenny Down opposite the Bat & Ball pub. 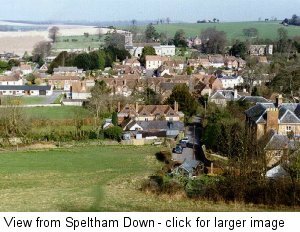 The village nestles along a valley and ancient riverbed running from the South Downs in East Hampshire. For 3000 years there has been a settlement in Hambledon and the human footprint of history can still be discerned; a Roman villa, a Saxon church and significant Norman and Medieval buildings. Hambledon is set in a typical southern English countryside in the South Downs National Park, surrounded by sweeping farmland and splendid woods. The Parish Council is no longer responsible for this Hambledon website. They have their own site which can be reached from the Menu Link. The webmaster owns and administers this site for the benefit of the community. The website aims to enable you to learn more about our community, what is going on, what we have to offer, where you can stay and some notable places to visit. Village Noticeboard highlights village notable events of immediate interest and longer term programmes of the principal organisations, clubs and societies. Parish Council Website lists its objectives and responsibilities, when it meets, how Parish Councillors can be contacted and provides the latest agenda and minutes. Events provide detailed day-to-day information on planned village activities for two months ahead and further ahead when known. Directory lists the details of local Shops, Services and Businesses, including where to eat, drink & stay. The Hambledon community is very active with many Societies, Clubs and Groups involving arts, drama, and horticulture. Also to be found on this page are details of medical, educational and transport facilities. Church lists details of the Church of England Services, the Parochial Church Council and the many church activities. There is an outline history of the Church of St Peter and St Paul from its foundation in Saxon times up to today. School page has direct link to the Hambledon School's own website. Village Maps on two scales showing the location of landmarks and points of special interest in and around the village. Links to local useful websites in Hampshire, places, people and organisations if interest - is under development. Contact Us enables visitors to contact the Webmaster and Content Administrator. Family History of people and families who live in the village over the years. Hambledon Past and Present is a short history of the village. 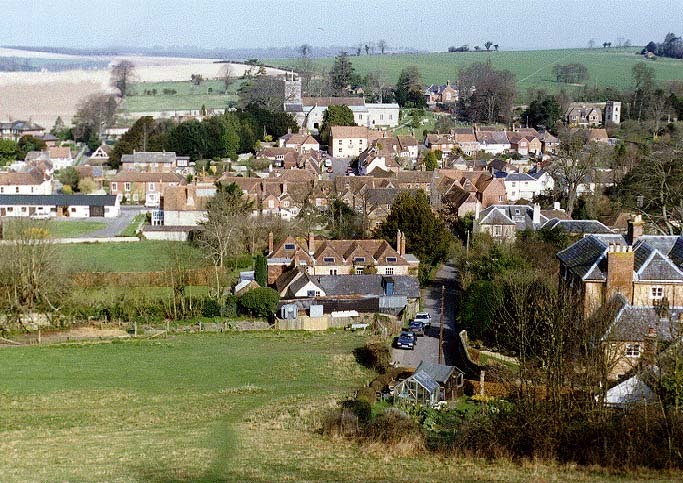 Village Walks around Hambledon to help see the varied attractions of the village. Vineyard and the replanting of the south-facing slope with new vines. What to Visit guidance on houses of interest, the beautiful gardens open to the public and the viewpoints to enable you make the most of your visit. The Cricket Menu concentrates on why Hambledon is the "Cradle of Cricket" and shows that the national game is alive and well in Hambledon. There are links to the Hambledon Cricket Club giving the fixture list and an overview of Hambledon in the history of cricket. The User Access Menu is for those contributing to the management and content of the website. The Parish of Hambledon originally comprised several manors and tithings, including Ervill's Exton, Burwell, Glidden, Chidden, Rushmere, Putte and Denmead. The Manor of Hambledon was granted to the Bishop of Winchester by King John in 1199 and remained with the bishopric until the English Civil War in 1650. In 1651 King Charles II spent the night of 13th October at Hambledon on his way to exile in France after the Battle of Worcester. The king was travelling from Somerset to the port of Shoreham, and lodged at his guide's house now known as "Kings Rest". At the restoration of Charles II the Parish of Hambledon reverted to the bishopric of Winchester. Hambledon is the "Cradle of Cricket" where the laws of the present-day game were formalised in 1770 and the early notable matches were played on Broadhalfpenny Down in the eighteenth century. John Nyren, the famous cricket writer, was born here in 1764, the son of Richard Nyren who founded the Hambledon Cricket Club. King George VI reviewed the British and Canadian troops encamped in Hambledon in May 1944 just before D-Day on the 6th June 1944 in the field opposite Bury Lodge. More recently a retired Major General started the rebirth of English vine growing and the making of English white wine which had died out in the time of King Henry VIII some 400 years earlier.